Get ready for some family-friendly competition in Nintendo's latest Mario Party game. It’s officially fall and the holiday season is quickly approaching, which means some of the biggest video games of 2018 are right on our doorstep. October will see the release of everything from a family-friendly board game (with a twist) in Super Mario Party to a kart racing game starring popular cartoon characters like Spongebob Squarepants. 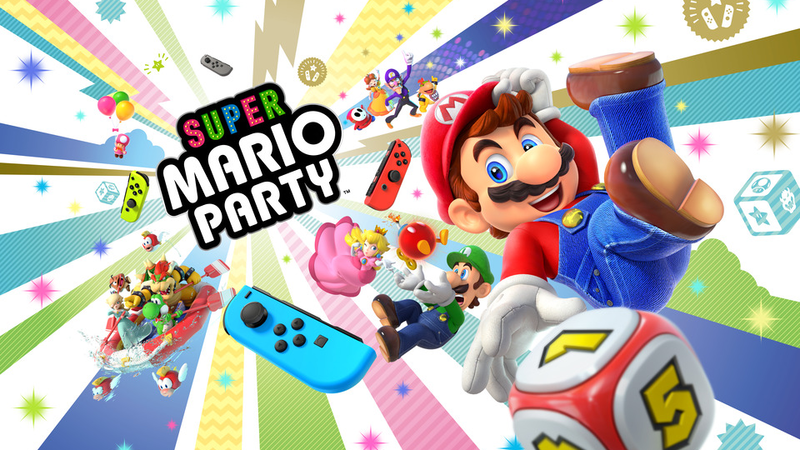 The latest installment in Nintendo’s popular party game series will let up to four players compete in 80 mini-games as they make their way around a virtual game board. In addition to this traditional mode, players can team up in a two-vs-two mode, or play sets of mini-games in the Mariothon mode. If your household has two Switch consoles, you can also try the Toad’s Rec Room mode, which pairs the two systems and allows you to play special games. Finally, if you’re subscribed to the new Nintendo Switch Online service, you can compete against other players online. This action adventure game combines real-world figures with virtual gameplay as players become the leader of a group of interstellar pilots on a quest to save the galaxy from a powerful enemy named Grax. The game’s starter pack comes with everything players need to jump into the adventure, including a pilot figure, a spaceship, and multiple weapons that can be attached to the ship to bring them into the game’s digital world. Additional pilot, spaceship, and weapon figures can be purchased separately, so kids can mix and match their favorite items to suit their play style. In addition, the Switch version of Starlink: Battle for Atlas features Fox McCloud from Nintendo's Star Fox franchise. The Switch starter pack includes a Fox McCloud pilot figure, as well as an Arwing spaceship, which is also from the Star Fox games. In this latest installment in the popular Lego video game franchise, the Justice League has vanished, leaving DC comics villains like The Joker, Harley Quinn, and Lex Luthor to save the day when a new group threatens Earth’s safety. Kids can design and play as their own super villain character as they explore locations from the DC comics universe. Like other Lego games, Lego DC Super-Villains will let kids and parents team up and play together via two-player multiplayer. This kart racing game lets up to four players get behind the wheel as 12 characters from popular Nickelodeon television shows: Spongebob, Patrick, and Sandy from Spongebob Squarepants, all four Teenage Mutant Ninja Turtles, Arnold and Helga from Hey Arnold, and Tommy, Angelica, and Reptar from Rugrats. Players can compete to win cups and kart upgrades across 24 slime-filled tracks set in the worlds of these Nick shows. In addition to competing in races, players can take on challenges in the game’s Battle Arena mode.